Pic(k) of the Week: OMG(ose)! Gose 1 was once a 'style' of tart wheat beer popular in, and near, Leipzig, Germany. By the mid-twentieth century, it had died from neglect. Now, in the twenty-first, a few breweries have resuscitated Gose, in its birthland and elsewhere, such as in Baltimore, Maryland, U.S.A., at Union Craft Brewing. What did (does) Gose taste like? Historical recreations are problematic, but we can surmise that Gose appeared opalescently golden, and, akin to Berliner weisse —the "Champagne du nord"—its upcountry sibling, tasted lemony and sour, almost puckeringly so, and was fairly low in alcohol: 3-4%. It would have had much less of a banana-clove character than does hefe-weizen, its better-known wheat-beer cousin. Salt is an essential component of the Gose grist, either through a surfeit in the brewing water or an after-the-fact addition. To be sure, brewers have long used the chloride fraction of salts —such as sodium chloride (table salt) and calcium chloride— to enhance sweetness, and they still do in many beers. But, when brewing Gose, they favor salinity over confection, and with an additional dusting of coriander spice. At Baltimore, Maryland's 2-year-old Union Craft Brewing, brewer/owner Kevin Blodger 'sour-mashes' his Old Pro Gose, folding a lactobacillus bacteria culture into the wheat/barley mash and letting it concoct, covered, overnight. Jon Zerevitz, co-founder of the brewery, describes the fermentation's next-morning odor as that of a locker room, dumped with sweat-soaked socks(!). Blodger strains off the funkified, soured wort (in brewer's parlance, he lauters it) and ferments that in the normal fashion with 'normal' ale yeast. At the recent Maryland Craft Beer Festival, in Frederick, Maryland 3, an unsupecting drinker had quite an amusing reaction to the sour funk of Old Pro Gose. Definitely a Pic(k) of the Week! For such a relatively low-alcohol beer, Old Pro had a surprisingly full, chewey mouthfeel. It was refreshingly tart with a lemon-citrus flavor. But first, right upfront, unmistakably, there was that aroma like a healthy-sized crumble of blue cheese floating in the beer. 1 Pronounce Gose as GOES-uh (the 's' like a 'z'). Not all 'wild' beers are necessarily sour beers; and not all sour beers are 'wild' beers. Beers fermented with brettanomyces yeast, for example, can be 'barnyardy funky,' but not necessarily sour; and beers fermented with lactobacillus bacteria will be sour to some extent, but not necessarily 'funky.' The level of funk has varied in the few Goses I've tasted. If there is a 'modern classic,' so to speak, it might be the Gose from the Gosebrauerei Bayerischer Bahnhof, in Leipzig, Germany. British beer writer, Ron Pattinson's description at his blog, Shut Up About Barclay Perkins: here and here. Much of I wrote above on Gose is derived from Pattinsons's work. Brewing with Wheat: The ‘Wit’ and ‘Weizen’ of World Wheat Beer Styles, by renowned beer writer, Stan Hieronymus. American Sour Beers: Innovative Techniques for Mixed Fermentations, by Michael Tonsmeire, to be released later this June. Tonsmeire is a Washington, D.C.-area based homebrewer, who blogs under the handle, The Mad Fermentationist. In 2011, Blodger brewed the same Gose recipe while working at the Gordon-Biersch brewpub in Rockville, Maryland, and received a bronze medal for it, at that year's Great American Beer Festival. 3 The photo was taken at the 9th annual Maryland Craft Beer Festival. 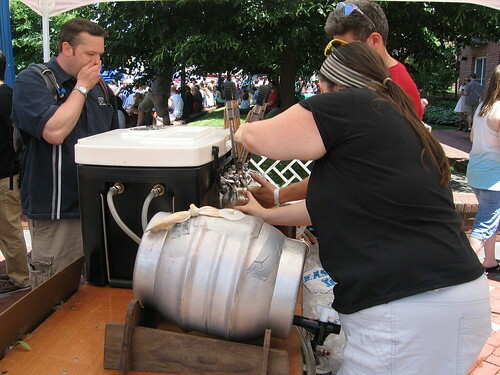 Held at Carroll Creek Park in Frederick, Maryland, on 31 May 2014, the festival featured over 125 beers from more than 25 Maryland breweries, poured by the brewers. It was organized by —and benefited— the Brewers Association of Maryland (BAM), the nonprofit trade association of Maryland’s brewing companies. More photos from the MdCBF: here. Old Pro is one of my favorite beers around. It's definitely something I'll be looking forward to in the summers to come.